First marketed by the Bayer Company in 1897, aspirin (acetylsalicylic acid) is one of our oldest modern medications — and its parent compound is much older still, since Hippocrates and the ancient Egyptians used willow bark, which contains salicylates, to treat fever and pain. Over the past 100 years, aspirin has made its way into nearly every medicine chest in America. Indeed, this old drug is still widely recommended to control fever, headaches, arthritis, and pain. Although aspirin remains an excellent medication for fever and pain, other drugs can fill these roles equally well. But aspirin has a unique role that was not even suspected by its early advocates. In patients with coronary artery disease, aspirin prevents heart attacks. The first evidence that aspirin could protect the heart did not come from an academic medical center but from a general practitioner. Beginning in the 1940s, Dr. Lawrence L. Craven advised all his male patients between the ages of 40 and 65 to take aspirin every day to prevent coronary thrombosis (clots in the heart's arteries). It seemed to work; Dr. Craven reported that surprisingly few of his patients had heart attacks or strokes. Dr. Craven's observations were astute, and they support Yogi Berra's belief that you can observe a lot just by watching. Still, even the most careful clinical observations must be confirmed by scientific research. It took some 40 years, but in 1989 Harvard's Physicians' Health Study provided impressive evidence that aspirin can indeed protect a man's heart. More than 22,000 men between the ages of 40 and 84 volunteered to take either a standard 325-milligram (mg) aspirin tablet or a placebo every other day. Over the next five years, the men taking aspirin suffered 44% fewer heart attacks than their peers taking placebo. That would make low-dose aspirin seem like a sure winner, but the Harvard researchers noted some nuances: although aspirin protected against heart attacks, it did not reduce the risk of cardiac death, and all the benefit was confined to men older than 50. And even in low doses, aspirin increased the risk of bleeding. Scientists have continued to learn a lot about aspirin. Although the research has confirmed some findings of the Harvard study from the 1980s, it has also produced many complexities. Doctors still have a lot of questions about aspirin, and since every man must decide if aspirin for prevention is right for him, you may have questions, too. Here are some answers — and some questions for additional research to puzzle out. How does aspirin protect the heart? The short answer is fairly straightforward. In the early stages of heart disease, cholesterol builds up in the walls of one or more coronary arteries. The deposits trigger inflammation, eventually producing plaques that narrow the artery. Large blockages may prevent the heart muscle from getting all the blood it needs, often causing the pain of angina. But a heart attack requires an additional insult, and in most cases, a small, relatively new plaque is the culprit. First, the plaque develops a fissure or rupture, exposing its contents to the bloodstream. Tiny blood cells called platelets stick to the ruptured plaque, and the sticky, activated platelets rapidly form a clot that completely blocks the artery, killing the heart muscle cells that rely on that particular artery for their oxygen-rich blood. Aspirin prevents heart attacks by stopping platelets from sticking together and forming artery-blocking clots. The long answer is a bit complicated, but it's important since it explains aspirin's side effects as well as its benefits. Aspirin's actions begin with its effects on two important enzymes, cyclooxygenase-1 (COX-1) and cyclooxygenase-2 (COX-2). Think of COX-1 as a "housekeeping" enzyme because it's present in many tissues, where it helps maintain various functions. For the most part, COX-1 does its job by stimulating a family of chemicals called prostaglandins. A particular prostaglandin (thromboxane A2) is the "glue" that makes platelets stick together and form clots. By inhibiting COX-1, aspirin interrupts this chain of events and reduces the risk of heart attacks. But since platelets also trigger the "good" clots that stanch bleeding from injured tissues, aspirin increases bleeding, whether from a shaving nick or a serious wound. Prostaglandins in the stomach stimulate gastric blood flow and the production of acid-neutralizing bicarbonate and protective mucus. By inhibiting COX-1, aspirin reduces prostaglandins that protect the stomach, increasing the risk of bleeding and ulcers. Prostaglandins also help regulate kidney function and blood flow. 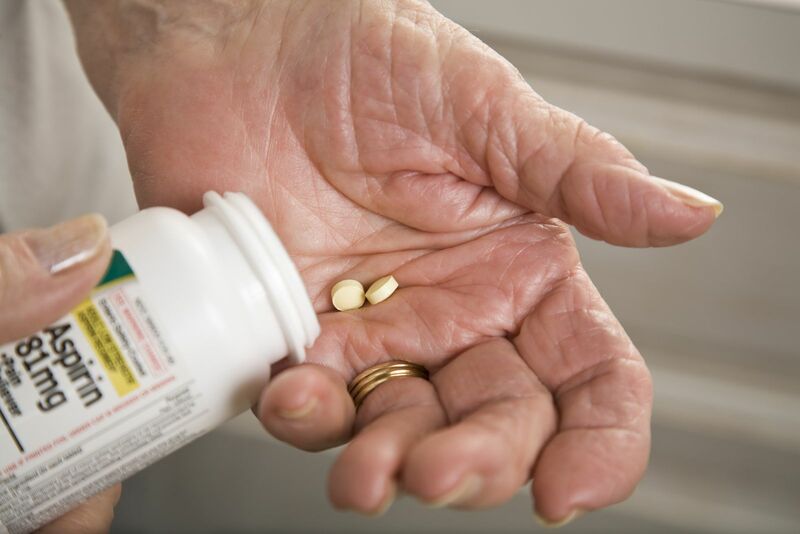 By inhibiting COX-1, aspirin can reduce these protective chemicals, sometimes raising blood pressure or reducing kidney function, especially in the elderly or in patients with kidney disease. If COX-1 is a housekeeping enzyme, COX-2 is more of a troubleshooter. Instead of hanging around in healthy cells and tissues, it gets fired up in response to assaults such as infection and inflammation. COX-2 generates chemicals that trigger fever and pain; drugs that inhibit COX-2 do a nice job of reducing pain and lowering high temperatures. But COX-2 is not all bad; it also produces prostacyclin, a chemical that widens arteries and fights blood clotting. Drugs that inhibit COX-2 may increase the risk of heart attack and stroke by reducing prostacyclin. That's why the selective COX-2 inhibitors rofecoxib (Vioxx) and valdecoxib (Bextra) were withdrawn from the market, while a third one, celecoxib (Celebrex) requires extreme care. And it's also why the many nonsteroidal anti-inflammatory drugs (NSAIDs) that inhibit both COX-1 and COX-2 have a mixed reputation. How much aspirin do I need for my heart? Similar to other NSAIDs, aspirin increases the risk of bleeding. The good news is that you only need doses to protect the heart. Most experts now recommend 81 mg (a "baby" aspirin) a day for prevention. Should I take aspirin if I develop heart attack symptoms? Because the clotting process is already under way as a heart attack develops, speed is essential. To get aspirin into your bloodstream as quickly as possible, chew and swallow an uncoated 325 mg (full adult size) tablet as soon as possible. And call 911 just as quickly. I've recovered from my heart attack; do I still need aspirin? The goal is to prevent another attack (doctors call it secondary prevention), and aspirin does help. Unless there is a specific reason not to take aspirin, everyone with coronary artery disease should take an aspirin every day; 81 mg is a reasonable daily dose. I don't have heart disease, but I do have blockages in my leg arteries; should I take aspirin? Yes. Your blockages represent peripheral artery disease (PAD). Like coronary artery disease, PAD is a manifestation of atherosclerosis. So aspirin helps prevent clots in the legs and also decreases the risk of heart attack and stroke. Will enteric-coated aspirin reduce my risk of ulcers and bleeding? Aspirin in the stomach is not the problem; aspirin in the blood inhibits COX-1, reducing the prostaglandins that protect the stomach. Does enteric-coated aspirin work as well as uncoated aspirin? Some doctors have worried that it might not, but since enough gets into the blood to increase the risk of bleeding, enough gets in to inhibit platelets and protect the heart. In fact, COX-1 and platelets are so sensitive to aspirin that doses as small as 30 mg will inhibit all the platelets in the body. And a head-to-head trial that compared 81 mg of coated and uncoated aspirin in 50 volunteers showed that they are equally effective in inhibiting platelets. But since rapid action is essential during a heart attack, chew an uncoated aspirin if you develop worrisome symptoms. Is there any way to protect my stomach from aspirin-induced bleeding? Low doses of aspirin appear to pose less risk than higher doses, so sticking to 81 mg a day should help. It is even more important to avoid other NSAIDs, or if you have to use one, to take the lowest effective dose for the shortest time possible. And it's also important to be careful with alcohol and other things that can irritate the stomach. If you are at high risk for gastrointestinal bleeding but still need aspirin, you can get protection by taking an acid-suppressing proton pump inhibitor, such as omeprazole (generic, Prilosec). Can I be allergic to aspirin? And if I am, what can I do? It's not common, but some people are allergic to aspirin. For others, the drug is ineffective. A number of strategies are available for these folks; the most straightforward is to take a different antiplatelet drug, such as clopidogrel. If I take low-dose aspirin but need more help for pain or fever, what should I choose? Acetaminophen (Tylenol and other brands). It does not target either COX enzyme, so it doesn't inhibit platelets or increase the risk of bleeding. Acetaminophen won't protect your heart, but it is very effective for fever and mild to moderate pain. Like all medications, though, it has potential side effects of its own. To avoid liver injury, take acetaminophen every four to six hours as needed, but don't exceed a total dose of 3,250 mg a day. What about other NSAIDs and my heart? Aspirin is much, much more active against COX-1 than COX-2; that's why it can protect the heart but also cause gastrointestinal bleeding. At the other end of the spectrum is the selective COX-2 inhibitor celecoxib; by inhibiting COX-2, it can fight pain and inflammation, but it also increases the risk of cardiovascular problems. The other NSAIDs inhibit both COX-1 and COX-2, though the exact balance varies from drug to drug. The pessimist would note that these medications' side effects encompass the worst of both worlds, since they increase the risk of gastrointestinal bleeding and heart attacks. Indeed, since 2005, the FDA requires a "black box" warning about cardiovascular risk for all NSAIDs except aspirin. Still, millions of Americans take NSAIDs, and they are helpful for arthritis and pain. Don't use an NSAID unless you really need it, and then use the lowest effective dose for the shortest time possible. Follow directions carefully, stay alert for side effects, and consider a medication to protect your stomach if you are at high risk of bleeding (see above). If you need to take ibuprofen (Advil, Motrin, other brands), be aware that it can interfere with the heart-protective platelet-inhibiting effect of low-dose aspirin. By taking your aspirin two hours before your ibuprofen, you can avoid the problem. Does low-dose aspirin have other benefits? Possibly. In particular, there is reason to hope that it may reduce the risk of colon cancer and possibly other malignancies. At present, though, it is premature to recommend low-dose aspirin to prevent cancer (though patients who have had colon cancer might be wise to consider it to help lower their risk of a recurrence). Should I take my low-dose aspirin in the morning or at night? It probably doesn't matter. Platelets are so sensitive to aspirin that a single 81-mg dose will inhibit the stickiness of all the platelets in your body — and the inhibition is irreversible. But if the inhibition is permanent, platelets are not. In fact, they are short-lived cells that are constantly being removed from your blood and replaced by a steady stream of new platelets that pour out from your bone marrow. You need to take aspirin on a regular basis to inhibit these new platelets. Should I stop taking my aspirin before elective surgery? After you stop aspirin, its effects slowly wear off as new platelets replace older, inhibited cells. Bleeding tests return to normal after four days, and detailed tests of platelet function are entirely normal by six days. If you are having only minor surgery, you may not need to stop aspirin at all. If you are free of heart disease and are taking aspirin for primary prevention, it's reasonable to stop aspirin six days before your operation. But if you've had a heart attack or have angina, the situation is tricky; your cardiologist would like you to continue aspirin as long as possible, but your surgeon would probably prefer to have you off it for about six days. Let them duke it out, but if they can't decide, you might split the difference by stopping your aspirin a few days before surgery. Should I take aspirin for heart attack prevention? If you have angina or have had a heart attack, you should take 81 mg a day unless you have a compelling reason not to take aspirin. If your reason is previous gastrointestinal bleeding, consider taking a proton pump inhibitor or misoprostol to protect your stomach while you take aspirin. If you have a true aspirin allergy, consider taking clopidogrel instead. If you don't have heart disease, the answer is more complex. It depends on your individual heart attack risk. Talk with your doctor. If you are one of the many American men at risk, aspirin can help. But prevention requires much more than a baby aspirin a day. To keep your heart healthy, avoid tobacco in all its forms; keep your cholesterol, blood pressure, and blood sugar low; exercise regularly; eat right; stay lean; and avoid excessive stress.